The New York Times is catching up to the grassroots opposition to big energy projects, clean energy or dirty. Today the paper reported on the developing push back to big oil pipelines, big electrical transmission lines, and other energy transport projects of scale. The dimensions of what needs to be done to push the country from high-carbon energy production to lower carbon production is as vast as anything the nation has attempted. That’s why it’s going much more slowly than most environmentalists and business executives anticipated. Not only are there technical gulfs to be crossed, there also are social oceans to navigate. Among the most important is a basic American revulsion to size and scale in the clean energy sector that is expressing itself in every part of the country. Here in northern Michigan, for instance, Duke Energy late last year abandoned its plan to build 112 utility-scale wind turbines in Benzie and Manistee counties, principally because of revulsion by enough summer and full-time residents to their size. As we’ve reported here for several years, there aren’t too many American clean energy sector projects of scale that haven’t come under pressure at the grassroots simply for being big. Big wind. Big solar. Big geothermal. Big transmission lines. The clash over the Keystone XL Pipeline, which would extend from Alberta, Canada to the Gulf Coast, also involves scale to some extent. It’s the first big individual infrastructure project of the new era of unconventional fossil fuel development that has attracted such public upheaval, though the water-intensive hydro-fracking production technology that led to the higher oil and gas production also is generating pointed criticism. The oil and gas industry will have a much easier time moving their products to market, as the developments in North Dakota, Texas, Oklahoma, Colorado, and the mid-Atlantic show. Americans are more comfortable with the fuels they know. And most of the pipeline infrastructure is already in place and simply needs to be extended to reach the new gas and oil fields. There’s almost $17 billion worth of pipeline construction, just completed or now occurring in the U.S. without the $7 billion Keystone XL and its earlier completed $5 billion Keystone project. Completed and Proposed Oil and Natural Gas Pipelines in U.S.
Clean energy is encountering more difficult circumstances. The big solar and wind projects, for instance, that only a few years ago were viewed as low-carbon savior technologies by the American environmental community, are now seen as threats — to viewsheds, endangered species, public health, whatever. Transmission lines across wild lands are now viewed as dangerous and unsightly. The public push-back points to a new stage of development, from centralized power generation in big plants, to decentralized clean energy production. That means installing solar arrays on individual business and residential rooftops, or building small wind generating stations that fit into neighborhoods and communities. While the concept may seem attractive, implementing such a scheme will take at least a generation even if it doesn’t run into any new civic opposition. In the meantime, America is pushing as hard as it can to perpetuate the fossil fuel era, and losing momentum to China and Europe in clean energy production. 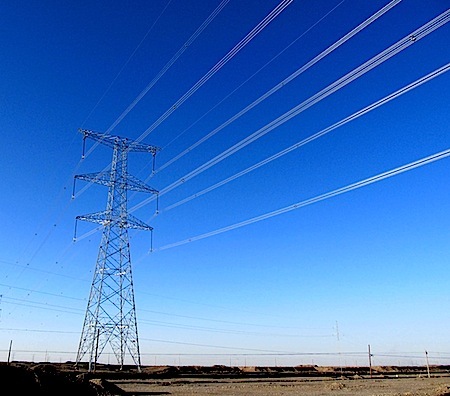 The 750 kv transmission line in Gansu Province, China (above), which I photographed a year ago, transports power from new wind and solar installations in the northwestern deserts to the interior, and encountered no opposition. In contrast, just last week in Michigan, Energy Conversion Devices, the parent of United Solar Ovonic, announced its plans to file for bankruptcy. United Solar Ovonic, the maker of thin-film photovoltaic panels, was for a short time one of the darlings of Midwest clean energy manufacturing sector.